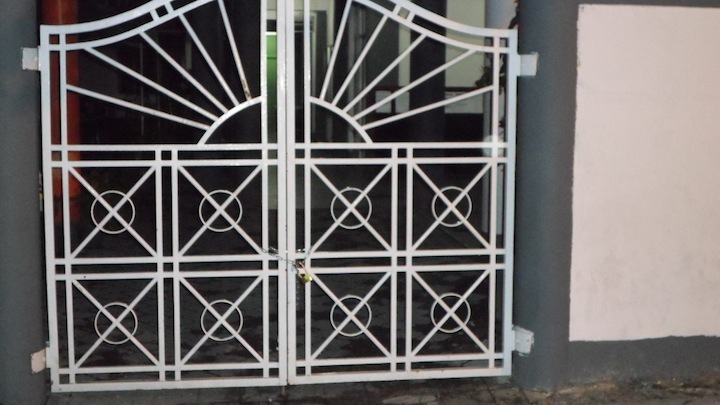 The ministry of education locked up the Mandhu College in Malé last night after a 24-hour eviction notice expired yesterday, sparking an outcry on social media outcry. The notice stated that entering the grounds without a special permit from the ministry is illegal, and advised contacting the ministry to make arrangements for removing private property. “Nobody and nothing is safe,” Mandhu College chairman Ibrahim ‘Ibra’ Ismail tweeted last night. Tonight, Maldivians will hv seen that this govt will stop at nothing in their barbarism. Nobody and nothing is safe. The civil court reportedly granted a stay order halting the eviction, before holding a separate hearing to annul the stay order. “Going into court in 15 mins to try and save 1500 students’ future. Many of them too poor to come to Male’ to study. Pray for them,” Ibra tweeted yesterday after the education ministry gave a notice to to clear the premises by 3:00pm. Mandhu college launched a virtual campus in August last year and offers online courses to students residing in islands across the country. The owner of the international school transferred the agreement to Malé High Pvt Ltd, which operates Mandhu College, and registered the international school under the company. Operating a college in the premises was contrary to the purpose of the agreement, the ministry said, noting that public schools in the capital faced problems due to lack of capacity. The education ministry previously ordered Mandhu to vacate the premises in January, but extended the deadline to May 30. The first semester at the college ended last week. “It is with deep sadness that the college has to inform its students that the police have forcibly and unlawfully entered the college premises at around midnight tonight and evicted all staff and taken over all property of the college,” the college said. The forcible eviction has sparked outrage on social media, with one opposition MP suggesting that shutting down higher education institutions was a higher priority for police than investigating murders and other serious crimes. Maldivian school text books, sermons and other published materials on Islam breed hatred and Islamic fundamentalism, says rights NGO, Maldivian Democracy Network (MDN). The report, which is the first of its kind, analyzed text books used in Maldives for primary and secondary education in order to identify the prevalence of radical narratives in the mainstream academic discourse. The report noted that the school text books cultivate anti-Semitism and xenophobia, and glorify Jihad or war against those who allegedly “obstruct” Islam. All Maldivian students are required to take Islam as one of the four compulsory subjects, alongside Dhivehi, English and Mathematics from first grade through twelfth grade. Islamic studies text books are prepared by specialists at the ministry of education and approved by the ministry of Islamic affairs. The government is struggling to prevent an outflow of Maldivians seeking to join the civil wars in the Middle-East. The police in January said over 50 individuals have left the country, while the opposition puts the number at 200. In addition to analyzing text books, the human rights NGO held public forums in several islands to ascertain whether the public view human rights and Islam to be compatible, and conducted interviews with Islamic ministry officials and heads of schools. MDN noted that two whole pages of the book were dedicated to “fruits” of Jihad, claiming that the ultimate fruit of Jihad is martyrdom, for which the reward in Islam is an eternity in heaven. “These discussions fuel hatred an depict the religion as one that is set on building hegemony,” read the MDN report. An autobiography of a Maldivian man, who was killed while waging Jihad at Syria posted by Bilad-al-Sham media group, claimed that many students studying at the main secondary school, Center of Higher Secondary Education, had chosen to engage in Jihad. “Though it has a secular curriculum, so far from that very school has come out many shining stars in the path of Jihad and students whose hears filled with the love of Islam. Allah Akbar!” read the biography of Abu Dujanah, who reportedly died in battle in Syria in September 2014. MDN noted that Islamic textbooks for grade one, two and three contain material instilling love for Islam and rarely incites hatred through xenophobic narratives. “However, from grade four onwards the xenophobic material gradually increases to the point where the radical outweighs the moderate,” the report read. 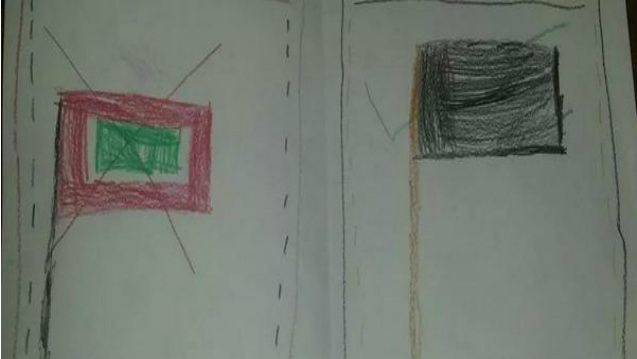 In the grade five textbook, Jews are described as “devious people” who “do not hold any value to their promises”, leading to stereotyping and has made anti-Semitism the norm in the Maldives. “For Instance, the grade nine text books dictates a lesson on “deceivers” or “liars” from the Muslim world or Ummah,” read the report. The books describe the Ahmadiyya sect as a “plot by the British to destroy Islamic Unity,” and says Muslims educated in the West, or Muslims who speak for secularism are considered co-conspirators with the West to undermine Islam. “Due to the prevalence of these radical ideas, the text books fail to primarily instill a positive interpretation of Islam that is manifested in the  Maldivian Constitution,” concluded the report. The tenth grade textbook says “slaves must work tirelessly to fulfill their masters needs,” and the eleventh grade textbook outlines discriminatory penalties under Islamic penal provisions for victims of a crime if they are a slave or a non-believer. “Such discriminatory and racialist attitudes in relation to religion should not be endorsed by educational literature in the modern world where slavery has been abolished,” the report read. MDN recommends the removal of “discriminatory content” from school books in order to create tolerance and good will to all members of the globalized world. The assessment was conducted with the assistance of Canadian Fund for Local Initiatives from December 2014 to March 2015. The Maldives has signed four Memorandums of Understanding with Pakistan today during president Abdulla Yameen’s ongoing two-day state visit. The MoUs were for mutual cooperation in healthcare, education, sports, and combating drug abuse. President Yameen was accompanied by first lady Fathmath Ibrahim, speaker of parliament Abdulla Maseeh Mohamed, and cabinet ministers. The delegation is due to return tonight. 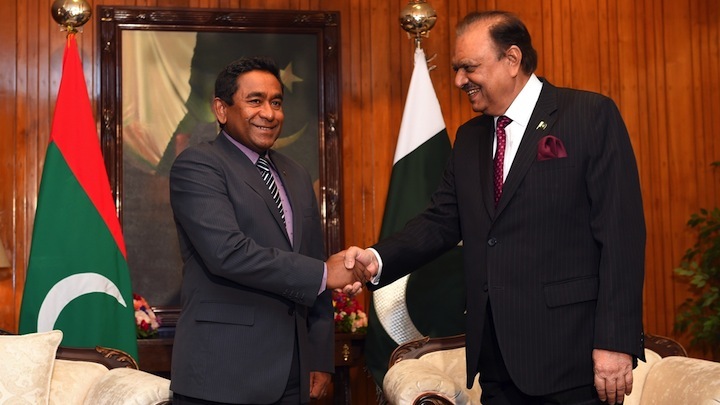 President Mamnoon Hussain hosted a banquet in honour of president Yameen last night. The pair held talks on strengthening bilateral ties earlier in the day. “President Yameen thanked his Pakistani counterpart for the excellent hospitality extended to himself and his delegation,” said the president’s office. Yameen has also reportedly invited prime minister Mohamed Nawaz Shareef to attend an official function due to be held on July 26 to mark the golden jubilee of the Maldives’ independence. President Abdulla Yameen has announced a rise in teachers salaries from the start of the academic year this Sunday (January 11). Speaking at a ceremony held last night at Dharubaaruge to inaugurate the salary scheme for senior players of national sporting teams, President Yameen stated that the increment will amount to over a third of the salary teachers are receiving at the moment. Teachers strikes regarding pay and working conditions were narrowly avoided last year after the government entered into negotiations with the Teachers Association of Maldives (TAM). Meanwhile, local media outlets have reported that the Ministry of Education will terminate the post of ‘leading teacher’. The ministry’s Permanent Secretary Dr Abdul Muhsin stated that the school staff structure is being revised, resulting in changes to the scope of responsibility and tasks assigned to different posts. While noting the revised staff structure has not been finalised, Muhsin assured that “all drafts of the structure have so far included the post of leading teachers”. Last month, the ministry announced that the position of deputy principal was to be abolished, with the 188 individuals currently holding the positions transferred to different posts, and administrative staff taking their place. Muhsin stated that he was unable to give any further details on the revised staff structure and salary hikes as neither had been finalised. Around 90 percent of the country’s teachers protested in September last year – wearing black clothing to raise awareness over issues such as poor pay, inadequate protection of teachers, and the failure to grant the TAM official recognition. The government avoided a full work stoppage just as strikes seemed set to go ahead, sitting down with TAM and creating a timeline in which to meet the demands of teachers. TAM Athif Abdul Hakeem was not responding to calls at the time of publication. In November, the Maldivian Democratic Party’s budget review committee suggested that the government had not budgeted the required MVR532 million (US$34.5 million) needed to raise the salaries of teachers despite promises made by both President Yameen and Vice President Dr Mohamed Jameel. The Maldivian Democratic Party (MDP) has said that the poorly prioritised education sector of the 2015 state budget is structured in a way which will eventually lead to corruption. While speaking at a press conference, MDP education and training committee chair and former education minister Dr Musthafa Luthfee criticised the allocation of a large budget to the education ministry without proper planning. MDP’s budget review committee earlier this week previously accused the 2015 state budget of being ‘aimless’ and criticised it heavily for not being goal-oriented. The record MVR 24.3 billion (US$ 1.58 billion) proposed budget for 2015 is currently at the committee stage in the Majlis, where today’s session was held behind closed doors for the first time in the legislature’s history. Dr Luthfee today claimed that the education budget of MVR2.45 billion (US$ 160 million) had no connection whatsoever to the government’s manifesto which had promised to bring ‘innovative’ changes to the sector in the upcoming year. Education minister Dr Aishath Shiham last week said “significant changes” had been brought to the education sector during the first year of the current administration, including introduction of Quran as a subject for grades one to seven, Arabic language in 20 schools, and vocational training. A volunteerism programme and a new “vocational education stream” would also form a major part of next year’s plans for the sector, she added. Malé City Council Deputy Mayor Shifa Mohamed – herself a former minister of education – alleged that the government had not budgeted the required MVR532 million (US$34.5 million) needed to raise the salaries of teachers despite promises made by both President Abdulla Yameen and Vice President Dr Mohamed Jameel Ahmed. The Teachers Association of Maldives (TAM) has threatened to stop work numerous times this year, demanding the government to reform the education system and to settle the pay discrepancies. After a full strike appeared inevitable in September, discussions with the government appeared to have gained results, with TAM expressing confidence that the president was attending to the issue. The MDP education committee also expressed concern over the MVR481 million (US$31.25 million) increase in the recurrent expenditure of the ministry while questioning the need for 2,159 new staff to be hired under the ministry. “Current teacher to student ratio stands at 1 to 9. We don’t understand the need to increase the number of teachers while the current teachers are not getting proper pay and the schools are in need of new facilities,” said Shifa. The government currently employs just under 25,000 civil servants, representing over seven percent of the population. Finance minister Abdulla Jihad told the public accounts committee last month that government would freeze recruitment for 2015 in a bid to control spending. Shifa today commented on the lack of allocated funds for the government’s promises to provide Arabic language as an additional subject in all schools and to ensure that Quran education is included in all stages of education. The education committee’s vice-chair, Shaifa Zuabir expressed the committee’s concern over promises to make the Maldives Polytechnic a central hub in training the 95,000 individuals who are to be provided with employment during President Yameen’s government. President Abdulla Yameen has vetoed amendments passed by the People’s Majlis to the Child Protection Act on October 14, requesting revisions based on advice from the attorney general. In a letter to parliament – read out at today’s sitting – President Yameen explained that the government submitted the amendments to the 1991 law to remove inconsistencies with the new Constitution adopted in August 2008. President Yameen noted that the amendment to Article 5(b) of the Child Protection Act contravenes Article 36(a) of the Constitution – which states that “Everyone has the right to education without any discrimination of any kind” – as it implies that the state does not have to provide free education to foreign or expatriate children residing in the country. “And considering Article 2 and 28 of the Convention on the Rights of the Child to which the Maldives has acceded, providing free primary education to all children living in the Maldives without discrimination is obligatory,” the president’s letter explained. Therefore, it added, the amendment to the Child Protection Act was contrary to the obligations placed on the state by the convention. Moreover, the president observed that the amendments make it mandatory for the state to provide pre-school education to all children. The amendments also contravene rules for the state to assist pre-schools operated by local councils specified in the Pre-schools Act of 2012. The president noted that providing mandatory free pre-school education in all inhabited islands would place a burden on the state budget and recommended consultations with the education ministry and finance ministry regarding government policy. In the ensuing debate, opposition Maldivian Democratic Party (MDP) MP Mariya Ahmed Didi criticised parliamentary committees for hastily approving legislation without proper study or consultations with stakeholders. Leader of the Majlis have in recent weeks, however, called upon committee members to speed up work after a number of Majlis sessions were cancelled due to lack of work on the house’s agenda. Progressive Party of Maldives (PPM) MP Jameel Usman had submitted the amendments on behalf of the government in June. The social affairs committee reviewed the amendments and forwarded the legislation to the Majlis floor earlier this month, after which it was passed with 51 votes in favour and two abstentions. MP Ahmed Nihan – parliamentary group leader of the PPM, the majority party in the Majlis – conceded that the inconsistencies with the constitution and pre-school law were missed due to an oversight in the legislative process. Nihan said the majority party should ensure that such incidents do not recur in the future. Following the debate, the amendment bill was returned to committee for further review with 58 votes in favour and one abstention. The National Inquiry on Access to Education for Children with Disabilities (AECD) along with the Human Rights Commission Maldives (HRCM) will be holding a hearing at the National Art Gallery from May 8 – 13th from 09:00 – 23:00. The purpose of this inquiry is to look in to the practices, policies and laws related to the education for children with disabilities and to determine the States role in providing for people with disabilities in a non-discriminatory manner, with a special focus on the educational needs of children with disabilities. The meetings will be used to collect statements from parents of children with disabilities. The AECD will then compile these into a report which they will present to the relevant Ministries, and the AECD will monitor how they are followed. Representatives of the Ministry of Health and the Ministry of Education will also be present, said a member of the AECD. The Teachers Association of Maldives (TAM) is organising a ‘black protest’ to draw attention to their issues ahead of a nationwide strike. TAM President Athif Abdul Hakeem said today that as a protest, teachers will be wearing black to work on 6 April 2014. “This is the first step, we want to draw attention to these issues. For the sake of our students we will go to work until we exhaust all other ways,” Athif told. A potential nationwide strike was announced last month citing pay discrepancies and failure to improve the education sector. According to TAM, the association in January requested for a meeting with the minister of education for discussing their issues, but it has still not been arranged. Athif said that teachers are still working overtime without being paid for it. “Independent institutions haven’t noticed this. If they don’t do those work it could be reflected in their appraisal, and they even fear termination. So they work. But without getting paid for the work,” he said. Teachers’ overtime allowances have been reduced to just five percent of the basic salary, which on average amounts to less than MVR300 per month. But teachers have complained that school will not run without teachers doing overtime work. Crown Prince of Saudi Arabia, Salman bin Abdulaziz has pledged to build ten “world-class” mosques in Maldives, Saudi news agency Arab News has reported. Quoting Maldives’ Islamic minister Sheikh Mohamed Shaheem, the agency stated the prince donated US$1million to the ministry for “various projects” and another US$1.5million for health projects. Prince Salman pledged to provide aid in the education sector, and Shaheem explained that an invitation was extended to him to visit Saudi Arabia and discuss way to bolster ties in “matters related to religion and education”. Yesterday Shaheem left for Saudi on an official trip. Other areas in which Saudi cooperation was sought during the prince’s visit include the ministry’s mosque ‘Waqf‘ fund, Center for Holy Quran, and in Hajj pilgrimage affairs. The report said that “it was not immediately known” if the the Maldivian proposal seeking US$300 million credit facility was discussed during the meeting. The credit facility – to finance the Maldives budget deficit – was pledged by the prince during former President Dr Mohamed Waheed’s visit to Saudi in July 2013. At the time DrWaheed told local media that it would be a 5-8 year loan with an interest rate of 1-2 percent. Saudi Arabia has already agreed to donate seven mosques this year, with MVR28.8 million allocated for six of these mosques in the Islamic Ministry programmes for 2014. Fifty Scholarships to study in Saudi Arabia were also announced recently, with just fourteen applications being received by the initial deadline. In January, a group of Saudi Islamic Scholars visited the country to conduct religious education ‘dawra’ program for local scholars. Haveeru reported that female Islamic scholars were excluded from these discussions, while the Saudi scholarships also require female students to be accompanied by a male ‘guardian’ or mahram during their time studying in the country. Islamic scholars from Saudi also conduct religious education ‘dawra’ programmes annually in the Maldives as a selection process for the Saudi funded Islamic education programs for a selected number of students. Prince Salman is expected to spend some time in the Maldives on holidays before returning to Saudi Arabia. During his official meeting with President Abdulla Yameen he discussed economic and diplomatic cooperation between the two countries.